This Chicago New Year’s cruise will have you enjoying the city skyline, the night sky, the Navy Pier and more as you sail into the New Year. Take in the views and party your way into 2019 with our live DJ onboard. This Chicago New Year’s cruise will keep this year’s hits blasting as you party on the seas. Dance to this year’s Top 40, Pop, Hip-Hop, and Dance hits and take over the dance floor with your friends. Our Chicago New Year’s cruise will be ending off the year with a champagne toast and a view of the Navy Pier New Year’s fireworks! Watch as the fireworks paint the night sky and leave 2018 on the seas. There’s no better place for you and your friends to party into the New Year in Chicago. 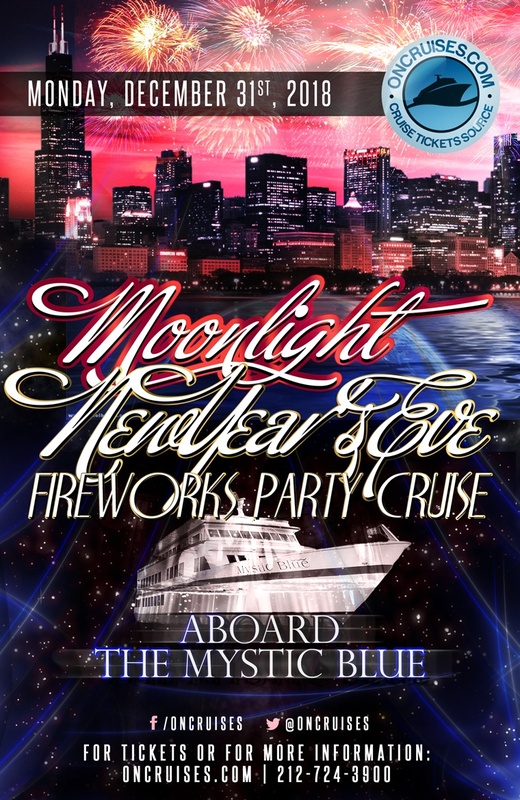 Book your tickets aboard our Chicago New Year’s cruise and party with us aboard the Mystic Blue!